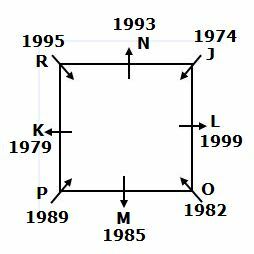 Eight persons J, K, L, M, N, O, P and R are sitting in a square table in such a way that four of them are sitting in four corners and four of them are sitting in middle of the four sides. The persons who are sitting at the corners facing centre and the persons who are sitting at middle of the sides are facing away from the centre of the table. They all are born in different years., 1974, 1979, 1982, 1985, 1989, 1993, 1995 and 1999 but not necessary in the same order. The one who was born in 1995 sits third to the right of M, who does not sit at any of the corners. Only one person sits between J and the one who was born in 1995. The one who was born in 1993 is an immediate neighbour of J. K sits second to the left of the one who was born in 1993. K sits opposite to the one who is the youngest person.The one who was born in 1985 sits second to the right of L, who does not face the same direction as J. L does not sit opposite to M. The one who was born in 1989 sits third to the left of N. The one who was born in 1974 faces the person who was born in 1989. O is younger than K and both of them are not immediate neighbours to each other. The difference between the ages of P and M is not more than five years. 1. Who among the following persons was born in 1995? The one who was born in 1995 sits third to the right of M, who does not sit at any of the corners. Only one person sits between J and the one who was born in 1995. The one who was born in 1993 is an immediate neighbour of J. K sits second to the left of the one who was born in 1993. K sits opposite to the one who is the youngest person. The one who was born in 1985 sits second to the right of L, who does not face the same direction as J. L does not sit opposite to M.
The one who was born in 1989 sits third to the left of N. The one who was born in 1974 faces the person who was born in 1989. O is younger than K and both of them are not immediate neighbours to each other. The difference between the ages of P and M is not more than five years. So, Case-2 will be dropped. 2. How many persons are sitting between N and P when counted from left of N? 4. What is the difference between the ages of L and P (in years)? 5. 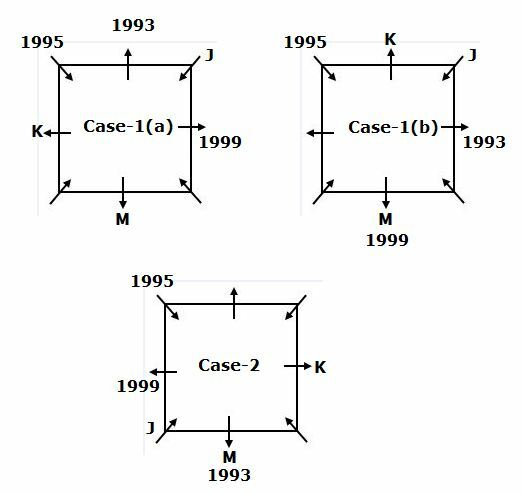 If N is related to 1985 and L is related to 1979 in a certain way. Then, O is related to which of the following? Direction (6-9): These questions are based on the five three-letter words given below. 6. If all the letters in the word are arranged in alphabetical order from left to right within the word and then the words are arranged as in the dictionary from left to right. Then which of the following words will be second from the right? 7. If all the consonants are changed to previous letter and all the vowels are changed to next letter of the English alphabetical series. Then how many words did not have any vowel? 8. How many alphabets are there in between the letters which are second letter of the third word from the left and first letter of the second word from the right end as in the English alphabetical series? 9. If all the words are arranged as in the dictionary from right to left, then which of the following will be second from the left end? 10. How many such pairs of letters are there in the word “ELEPHANT” each of which has as many letters between them in the word as in the English alphabets ? 1) Who among the following persons was born in 1995? 2) How many persons are sitting between N and P when counted from left of N? 4) What is the difference between the ages of L and P (in years)? 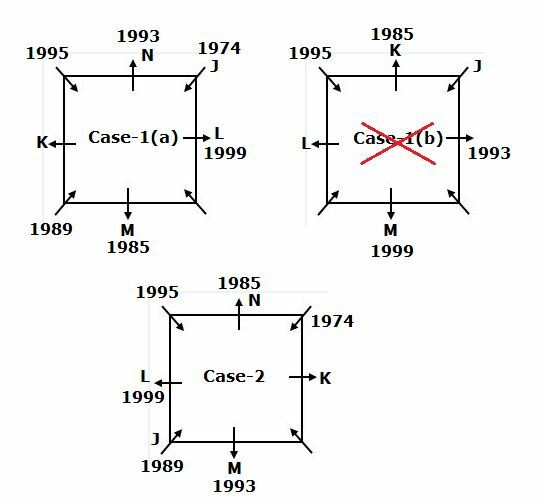 5) If N is related to 1985 and L is related to 1979 in a certain way. Then, O is related to which of the following? 6) If all the letters in the word are arranged in alphabetical order from left to right within the word and then the words are arranged as in the dictionary from left to right. Then which of the following words will be second from the right? 7) If all the consonants are changed to previous letter and all the vowels are changed to next letter of the English alphabetical series. Then how many words did not have any vowel? 8) How many alphabets are there in between the letters which are second letter of the third word from the left and first letter of the second word from the right end as in the English alphabetical series? 9) If all the words are arranged as in the dictionary from right to left, then which of the following will be second from the left end? 10) How many such pairs of letters are there in the word “ELEPHANT” each of which has as many letters between them in the word as in the English alphabets ?